We've kept a pretty close eye on the evolution of the Steam Controller over the past couple of years, and now we finally get to see it in action, in a video posted yesterday by YouTube guy OMGchad. In an interview recorded at PAX Prime 2015, Valve's Robin Walker (known best as one of the people behind Team Fortress and Team Fortress 2) explained that the "core problem" facing the designers was coming up with a controller that could properly work with every game in the Steam library, including a great many that were created with absolutely no consideration for controller support. The solution to that problem lies in the two "incredibly versatile" trackpads that dominate the upper corners of the controller. "We can virtualize them into things like a joystick, or a trackball, or a mouse, or any number of things like that," Walker said. Developers can create recommended settings for the unit, but so can users through what appears to be a very detailed editor. Those user-created settings can then be shared with the community, which should simplify the process of coming up with an ideal setup. Further revisions came when Valve noticed that users were taking their thumbs off the right-view thumbstick in order to press buttons. "We said, 'You shouldn't be taking your finger off the view control in a first-person shooter. How do we make it so you don't have to do that?'" Walker explained. That ultimately led to the addition of "grips" on the underside of the controller. "We take the common things that you might be taking your thumb off the view for, like reload or use or pickup or something like that, and we map it to the grips back there, so you can very quickly get to them." 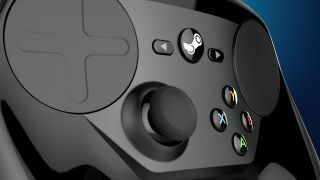 The Steam Controller is set to debut on November 10, and is available for pre-purchase now on—you guessed it—Steam.